A true Marmite wine, not only did this split opinion around the table, but the nose actually had a whiff of yeast extract. For better or for worse, I thought this was a great example of what the natural wine experience is all about. 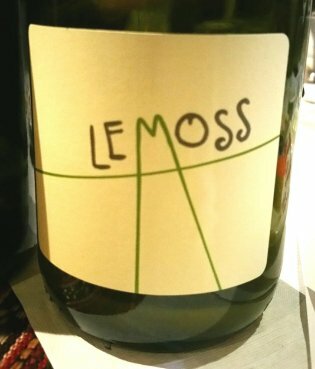 Lemoss, Ca’ di Rajo, Vino Frizzante Bianco, Non Filtrato, NV, 10.5%. Around £15 retail. This is a sparkling wine made from Glera grapes grown in the Prosecco region. So if it were produced differently it could bear the Prosecco name but, as it is, it is a mere sparkling white wine from Italy. Rather than undergoing the Prosecco production method of sealed-tank fermentation, this wine was given an initial skin maceration for 12hrs at 4ºC, fermented for 7-10 days at 15-17ºC using indigenous yeasts, then was put into a bottle, sealed with a crown cap, and allowed to ferment dry. Malolactic fermentation also took place in-bottle. The wine is cloudy, as there is no filtration, and no disgorging after the secondary fermentation. After the cloudiness, the next obvious impression was on the nose. And the impression was sulphur – struck matches – which is surprising considering the sulphite content is claimed to be only 25mg/l. However, it blows off eventually, leaving what is basically a rather neutral fresh smell, but with the slight whiff of Marmite I mentioned at the top of this post. As Marmite is a yeast extract, I presume the nose was due to dead yeast cells? On the palate it had medium acidity, and was dry. Again, quite neutral aromatically, but it was refreshing, with the acidity being sour rather than sharp. The mousse was fine. Overall, I found it a very pleasant drink, but it seemed to lack what I can only call vinosity. There was little body and fruit, and in many ways seemed more like beer than a wine. It was interesting to compare it with a proper Prosecco that was served at the same time, in fact a decent quality Valdobbiadene Prosecco from Adami called Vigneto Giardino. That had, I think, a touch of fennel on the nose, and ripe fruit on the palate with some leesy character. It was about the same acidity as the Lemoss, but a tad sweeter. The bubbles were coarser. It seemed to have more body, perhaps from the sugar as it had only another half percentage point more alcohol. Unsurprisingly, it was very much like Prosecco. This was good too, but it certainly lacked the interest of the Lemoss. In the end I decided I liked them both roughly equally (****), but in very different ways. If I were offered a straight choice of bottles to drink tomorrow, I would go for the Lemoss, as I feel I have unfinished business understanding it. But if I had the same choice next week as well, who knows? This entry was posted in My tasting notes and tagged italy, natural, prosecco. Bookmark the permalink. Controversial, moi? Just because I used a word that wasn’t strictly speaking necessary? To be more controversial, I think these pet nat wines should have their own regional DOCs. Apart from anything else, it would be more useful to the consumer than “Italian sparkling wine”.